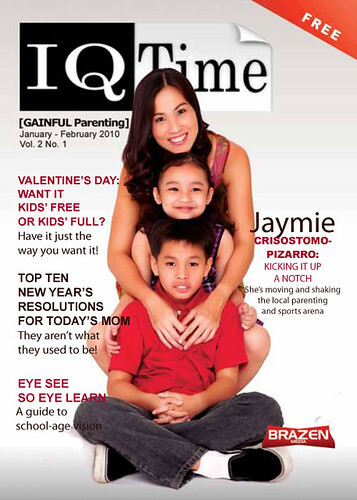 IQ Time featured my kids and I on the cover of its first issue for 2010. Me on the cover?! After having a long, good laugh about this, we spent half a day at the studio for the interview and shoot. The results? One of the best articles written about my life as the multi-tasking, hands-on mommy runner that I am. Thank you to IQ Time for the opportunity! In her chosen spheres of activity, she’s an emerging power. She is a prime example of how, even as stay-at-home moms, we can shape the world we live in. Jaymie Crisostomo-Pizarro isn’t inclined to hog the limelight or steal someone else’s thunder. But she’s definitely one of our local movers and shakers, influencing change in the areas of baby communication and sports. Ever heard of baby sign language? One of the comedic highlights in the 2004 hit movie, Meet The Fockers, was when Robert de Niro’s character was seen communicating with his infant grandson through baby signing. It soon became a widely-used means of communication between parents and their babies across North America. At around the same time, Jaymie Crisostomo-Pizarro was vacationing in Texas with her husband, Miguel, and their son, Anton. Pregnant with her second child, Nia, she chanced upon a magazine article on baby sign language and wanted to learn about this new baby communication phenomenon. By the time she was going back home, she was armed with a U.S. certification in baby sign language instruction. Since then, she has been shaking our mommy world by bringing to our awareness the fact that, even if our child is too young to talk, it’s never too early to communicate with him. This she does with her Baby Lingo workshops. Soon after she gave birth to her first born, she left the corporate scene. Her path to the post-corporate world has led her to many arenas. Now a full-time wife and a hands-on mother of two, Jaymie is a work-at-home graphic designer on weekdays. She holds her Baby Lingo workshops every first Saturday of the month. The workshop is a 3-hour session where parents of children aged 0-24 months learn how to “sign” with their infants. Yes, that’s how quickly parents can get into the baby signing habit. Her daughter, Nia, was a signer until she started verbalizing and she learned over 50 baby signs. These signs eliminated the guesswork in communicating with Mommy and allowed Nia to convey exactly what she wanted or needed. While the jury is still out on the scientific merits of baby signing, many experts contend that, instead of impeding speech development, it hastens speech ability as well as brain development. Jaymie enthuses, “There are studies to prove that it makes babies smarter. Like a study was done in 1987 wherein they had a group of baby signers and non-baby signers. When they were 3 years old, they were given tests. Those who signed when they were babies were talking like 4 year olds while those who didn’t sign were average. Fast forward to when they turned 8 years old, the same group took a test again. The baby signers had IQs 12 points higher than those who didn’t sign. At the start of the day, Jaymie is up and running. She’s running her household while creating and combining symbols, images and words as a graphic designer, or teaching baby signs to eager parents, or just on the road …running perhaps with the family or with human lions and gazelles, or with the wind. A self-admitted yo-yo dieter, Jaymie would slim down and bulk up until she took to running in 2006. Initially, she was just running on a treadmill. Soon after, she went outdoors, signing up for Pia Cayetano’s Pinay In Action race. From the moment she finished the race, she was hooked on running. Jaymie says, “At that time, I didn’t know a single runner. I’d talk so much about it to my husband and my girlfriends but they couldn’t relate. So, on my birthday, May 5, while I was sitting at the dining table with the computer in front of me, I just thought ‘Why don’t I create a blog and just talk about running.’ I also wanted to put up a list of races because at that time there was just one page of a web site with a race list. Since it was my birthday and I’m a Taurus and my dad said ever since that I’m bull-headed, I ended up with the blog name, The Bull Runner.” Today, her top-rated blog is a must-read for running enthusiasts and has developed into an income-generating hobby for Jaymie. Indeed, Jaymie runs her life like a bull. And she’s got quite a kick. While naming her Philippine Blog award-winning site blog, The Bull Runner, was an off-the-top-of-her-head idea, her blog is aptly named. Like the bull prized for its stamina, Jaymie continues on in the clutch. An intrepid student of life, she never stops learning and will never close the book till she achieves her personal best. Always moving, she has endless passion to finish what she started. It is that tenacity that gets her to places where the less courageous of heart would dare to tread further. Running in front of the bulls of humanity, she remains ahead of the herd, equipped not with speed but with knowledge, experience, and endurance. * IQ Time is distributed at doctor’s clinics in leading hospitals. All copy and images are courtesy of IQ Time. I agree with you also it definitely seeing help lot of people. 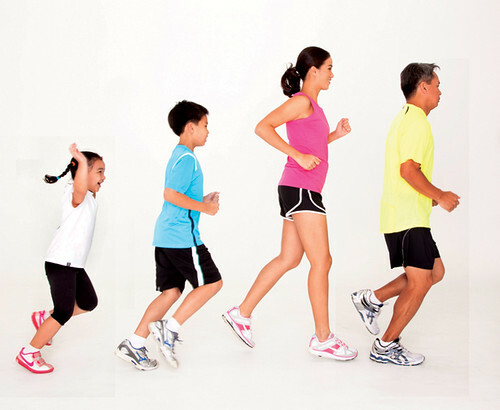 manang sooobrang cute ni Nia sa running family shot nyo…she’s a riot! hahahah! Wwooww… I’ve just been at our Pedia a while ago, and at Healthway yesterday, but wasn’t able to check if they have an IQ Time mag. Nice article and admire your family.More power for you!!! Congratulations, Jaymie! It must feel great to have such a beautifully-written article about you! this is the literal meaning of “It RUNS in the Family!” Kudos to The Bull Runner and her family! More Miles to Come! homg you look taller than miguel there!!!!! …Wow! What’s next for thebullrunner? Women’s Health Magazine article? Perhaps the cover girl? Nice article! It’s nice to know more about the other things that you do that we don’t usually see here on your site. It’s inspiring to see how you are able to balance your time with everything else that you do on top of your dedication and the time you spend in running. I enjoyed reading this. Ya, the non-TBR side. Congratulations!!! Nice article and more power. hi jaymie! im sharing this blog to my mom co-teachers. nice post and congrats! hey jaymie! i find the tags under the shoes so funny! congrats on this IQ magazine, i’d go look for one here in our clinic. that’s a very nice photo of the running family. very adorable. there is no emoticon for this!